It’s estimated that anywhere from 5-35% (depending on the source) of patients who’ve had a “technically successful” knee replacement will have severe chronic refractory knee pain. So, if you’ve had a knee replacement, it’s been 6 months (or more), and you’re still experiencing excruciating pain, there’s a definite problem. In the case of “successful” replacement, we are saying the actual hardware used for the knee joint is technically-sound, and it isn’t loose, infected, or mispositioned. Instead of the excellent, normal functioning you should expect, however, you are actually suffering from pain in and around the knee joint that can range anywhere from mild to severely debilitating. In these cases, the operating surgeon did everything by the book and it isn’t his or her fault – which means something else is at play. The likely explanation is injury, entrapment, or stretching of the nerve endings that travel to the skin around knee and the soft tissue around the joint. 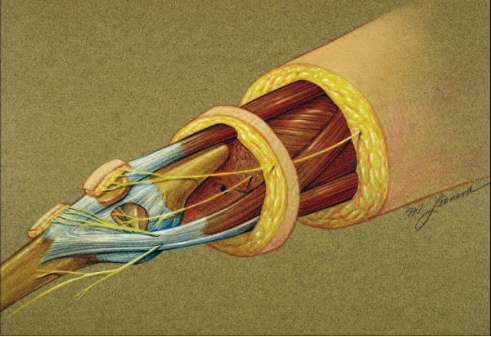 These nerves can be cut, divided, or stretched during the procedure to replace the knee. Most of the time this is unavoidable, and sometimes it can happen even in the hands of the most skilled orthopedic surgeons in the world. At present, there is still little understanding as to why some patients have no problems with this, while others are completely disabled by their pain. Frequently, patients presenting such symptoms are usually diagnosed with chronic regional pain syndrome (CRPS), or told that they have “RSD” (reflex sympathetic dystrophy). With these diagnoses, patients are often referred to prolonged physical therapy and then the medical pain management world for nerve blocks, injections, and medications. Thankfully, many of these patients will improve with time. However, if you are still suffering with debilitating pain six months (or more) after your knee surgery, it’s time to begin considering more aggressive options – such as actually looking for the cause of all that pain. So, what is likely the cause? Frequently, the source of the problems are injured nerves leading to the skin around the joint, along with nerves that go into the joint itself. Injury to these nerves means they send pain signals back to the brain! The affected nerves have been described as far back as 1857 by Dr. Rudinger in Germany, but only in recent history has the involvement of these nerves in the treatment of chronic pain been more systematically studied (specifically, in 1994-1996 by Dr. Lee Dellon). Effectively addressing and treating these nerves can be a very important key to improvement for those patients who are suffering from chronic knee pain after knee replacement or arthroscopic surgery (after all other correctable orthopedic causes have been ruled out). Spreading the word through the medical community about knee denervation was a key reason for Dr. Williams’ recent trip to Budapest, Hungary. His hope is that the trip will open doors for future projects and collaboration to improve patient outcomes and further relieve chronic pain and restore function for affected patients. Dr. Williams has spent the last 11 years working with these patients after learning denervation techniques in his fellowship from his mentor A Lee Dellon, MD, PhD, and has been an integral part of the Dellon Institute for Peripheral Nerve Surgery in Baltimore, MD since 2006. If you’ve had a knee replacement surgery that went as it should have and are still experiencing problems, come and see if we may be able to help. Doing so could potentially provide the relief you deserve. Request a consultation with our Baltimore office today by calling (410) 337-5400.